Top off a girl’s look for ballet class or wear this shrug over a tee shirt and jeans. It’s comfortable thanks to the smooth, easy-care yarn, no matter what the activity of the day. 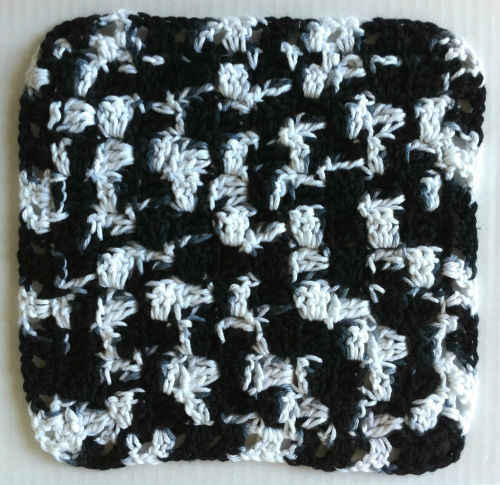 Gauge/Tension: GAUGE: 4 pattern repeats = 4” [10 cm]; 8 rows = 4” [10 cm] in pattern stitch. CHECK YOUR GAUGE. Use any size hook to obtain the gauge. Directions are for size 4 years; changes for sizes 6, 8 and 10 years are in parentheses. Shrug is worked from sleeve cuff to opposite sleeve cuff. Sleeves are worked in the round. Shoulder is worked back and forth in rows. Then piece is divided and Back and Front are worked separately in rows. Stitches are added and piece is worked back and forth in rows for opposite shoulder. Finally, piece is joined again and worked in the round for the second sleeve. Front is longer than the Back and asymmetrical so it can be worn buttoned or twisted on one shoulder. Fsc (foundation single crochet): Ch 2, insert hook in 2nd chain from hook and draw up a loop (ch stitch made) * yarn over and draw through 2 loops on hook (sc made), insert hook in ch stitch and draw up a loop; repeat from * for as many Fsc as called for in pattern. Note: Sleeve is worked in the round. Ch 36 (40, 44, 48). Being careful not to twist, slip st in first ch to join. Foundation Row: Ch 1, sc in same ch, sc in each ch around – 36 (40, 44, 48) sc. Round 1: Slip st in first 2 sc, ch 1, sc in same sc, *ch 7, skip 3 sc, sc in next sc; repeat from * around to beginning ch-7 space, ch 4, dc in first sc (ch 4 and dc counts as last ch-7 space) – 9 (10, 11, 12) ch-7 spaces. Round 3: Ch 1, sc in same st, *3 sc in ch-3 space, sc in next sc; repeat from * around to last ch-3 space, 3 sc in ch-3 space, slip st in first sc – 36 (40, 44, 48) sc. Repeat Rounds 1-3 until pattern has been worked 1 (2, 3, 4) times total. Note: Shoulder is worked in back and forth in rows. Row 1: Ch 7, skip next sc, sc in next sc, *ch 7, skip 3 sc, sc in next sc; repeat from * across to last 2 sts, ch 3, skip next st, dc in same st as first sc, do not join. Row 2: Ch 1, turn, sc in same st, *ch 3, sc in ch-7 space; repeat from * across, sc in 4th ch of ch-7. Row 3: Ch 1, turn, sc in same st, *3 sc in ch-3 space, sc in next st; repeat from * across – 37 (41, 45, 49) sc. Repeat Rows 1-3 for 2 (2, 2, 3) more times – 3 (3, 3, 4) repeats total for Shoulder; 4 (5, 6, 8) repeats total from beginning. Note: Back is worked in back and forth in rows. Row 1: Ch 7, skip next sc, sc in next sc, [ch 7, skip 3 sc, sc in next sc] 2 (2, 3, 3) times, ch 3, skip next st, dc in next st, leave remaining sts unworked. Row 3: Ch 1, turn, sc in first st, *3 sc in ch-3 space, sc in next st; repeat from * across – 17 (17, 21, 21) sc. Repeat Rows 1-3 for 2 (2, 4, 4) more times – 3 (3, 5, 5) repeats total for Back; 7 (8, 11, 13) repeats total from beginning. Do not fasten off. Cut yarn and set aside. Note: Front is worked in back and forth in rows and will be longer than the Back. Join yarn with slip st in first st at lower edge of Front and repeat Rows 1-3 as for Back – 17 (17, 21, 21) sc on Row 3. Work until 6 (7, 8, 9) repeats total for Front have been worked. Fasten off. Rejoin yarn in last st worked on Back, work 20 (24, 24, 28) Fsc – 37 (41, 45, 49) sts. Beginning with Row 1, repeat Rows 1-3 as for First Shoulder across all sts for 3 (3, 3, 4) times. On last repeat, slip st in first st to join. Beginning with Round 1, repeat Rounds 1-3 for 1 (2, 3, 4) times total. Fasten off. Weave in ends. Sew button on Front of second shoulder, using holes in pattern as buttonholes.